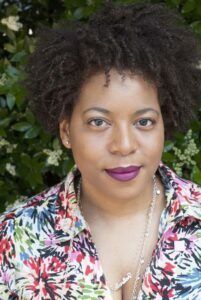 Kwajelyn Jackson currently serves as Executive Director at Feminist Women’s Health Center (FWHC) in Atlanta, GA, leading the entire organization’s operations, abortion clinic, civic engagement, education and outreach teams. Since 2013 she has led the expansion of FWHC’s statewide and national impact, and significantly deepened community partnerships. Under Kwajelyn’s leadership the community education and outreach work has had impactful successes including preventing new abortion restrictions in the legislature for 4 sessions, the launch of the Errin J. Vuley Fellows program and solidifying ties to key funding partners. She has the optimistic, vision, and pragmatism needed to lead a multigenerational, multiracial, reproductive health, rights, and justice organization in the South. Prior to joining FWHC, she spent three years as the Program Manager for WonderRoot Community Arts Center and eight years as a Credit Risk Manager with Wachovia Bank’s Community Development Finance Group. A third generation graduate of Spelman College, Kwajelyn and her brother both continue a family legacy of anti-oppression and reproductive justice activism. She received a BA Degree in economics from Spelman College and an MS Degree in urban policy studies from the Andrew Young School of Public Policy at Georgia State University. 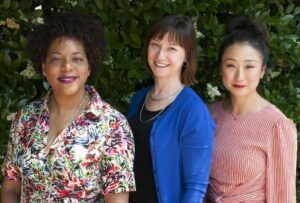 (L-R) Interim Executive Director Kwajelyn Jackson with Feminist Women’s Health Center’s Medical Director and Board Member. A respected voice on reproductive justice movement building, Kwajelyn is often sought after on the national level. She sits on the board of directors for All-Options, Abortion Care Network, Soul Food Cypher, and ProGeorgia, and is on the steering committees of the Black Mamas Matter Alliance and the Mife Coalition. Kwajelyn uses the lens of reproductive justice and anti-oppression to spark dialogue, transform perspectives, develop leaders, and cultivate change. She shares her time with her husband and her dog and when time permits, she enjoys attending dance classes, listening to podcasts, exploring museums, spending time with family and friends, fireworks, and hot summer days.